SAUGERTIES, NY (September 5, 2015): Internationally ranked competition continued at HITS Saugerties Friday with the $34,000 FEI HITS Jumper Classic, the only qualifying class of the week for Sunday’s Canadian Pacific $1 Million Grand Prix FEI CSI-5*. Spectators were on the edge of their seats down to the end when Pablo Barrios of Wellington, Florida, and his own Antares, and Saugerties’ own Heather Caristo-Williams and Evening Star, owned by Mr. and Mrs. Ralph Caristo, tied for the top spot. A field of 71 attempted the round one course set by Steve Stephens of Palmetto, Florida, with 23 going clean within the 80 second time allowed. Seventeen would opt to return for the jump off which proved to be a test for even the most seasoned riders. The first three in the order had four faults, followed by 13 faults for the fourth entry. That was until Conor Swail, of County Down, Ireland, aboard CITA, owned by Susan and Ariel Grange, swooped in to give fans the first clear in a time of 40.040. Fifth in the order, Caristo followed in Swail’s footsteps and sailed to a quick, clean round clocking in at 39.90 for the lead. Next in the order, and the next to go clear, Christine McCrea rode Candy Tribble & Windsor Show Stables Inc.’s Win for Life to a time of 43.670 to place her just behind Swail. Katie Dinan, tenth in the order, was clean with Amaretto D’arco, owned by Grant Road Partners LLC in a time of 43.830. A known speedster, Barrios reentered the ring twelfth and it was no surprise that he was ready to race the clock. With a clear course behind him, his time of 39.90 secured a tie for first with Caristo, bumping Swail to third, McCrea to fourth and Dinan to fifth. “To be honest, I wanted to be in the top three. I wasn’t expecting the best time with Heather. I’m hoping to sit here on Sunday too,” added Barrios who has his eyes set on the CP Million. Friday wasn’t just a day of competition at HITS, it was a day of horse sport education for 600 Saugerties School Children, grades 4 through 8. McLain Ward showed off his recent Pan American Games Gold Medal as he commentated on the Jumper Classic competition happening in front of them. HITS President and CEO Tom Struzzieri also explained the significance of the FEI CSI-5* week happening right in their own community while the students enjoyed a complimentary ringside lunch courtesy of HITS. FEI competition continues Saturday with the $100,000 FEI Hudson Valley Jumper Classic and Sunday for the CP $1 Million Grand Prix FEI CSI-5*, presented by Wells Fargo. Both classes will be available via live webcast at www.HitsShows.com. 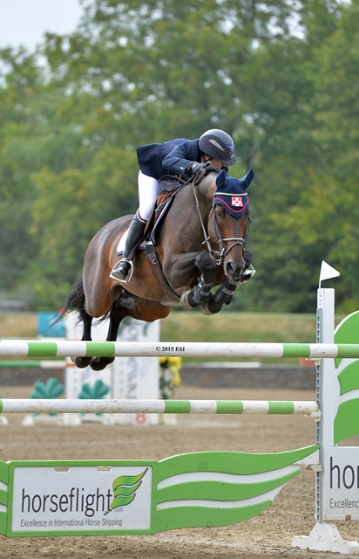 Heather Caristo-Williams and Evening Star on their way to a $34,000 FEI HITS Jumper Classic win at HITS Saugerties. 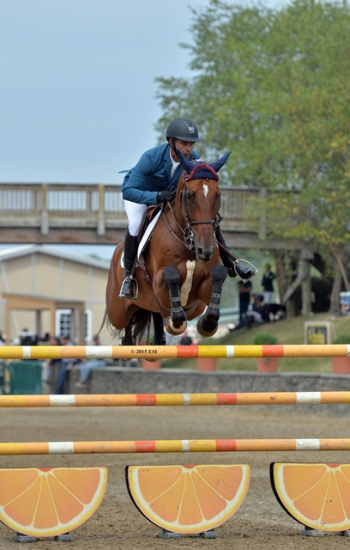 Pablo Barrios and Antares sailed through the $34,000 FEI HITS Jumper Classic course for a win at HITS Saugerties.